Gum Disease is one of the most common medical infections in the United States. 50% of the population has it but less than 3% get treatment In the initial stages of the disease, gums can be red, swollen and bleed easily. Some patients have no symptoms at all. As disease worsens, gums and bone that support the teeth become seriously damaged and the teeth become loose, fall out, or have to be removed. Recent evidence also shows a major link of untreated gum disease to many medical conditions including cardiovascular disease, diabetes, and pre-term and low birth weight babies. Previous treatments for Periodontal disease required multiple visits of specialized cleanings called scalings to control inflammation and then surgeries to peel back the gums to get access to finish cleaning, reshape bone, place bone grafts and then suture the tissue back in place. Although historically effective, this type of treatment is lengthy and in some patients produces significant discomfort. LANAP is less painful and less invasive. This Patent and FDA approved procedure is performed under local anesthesia. A tiny laser fiber (about the thickness of 3 human hairs) is inserted between the tooth and the gum. The laser selectively removes the diseased tissue without cutting away healthy tissue. The tooth roots are then cleaned of all plaque and tartar. The laser is then used to create a stable and firm fibrin blood clot to seal the opening. This allows the body to heal naturally with a regeneration of the lost bone and gum attachment. A patient’s entire mouth is treated in either 1 or 2 sessions. Current peer-reviewed study published in the International Journal of Periodontics and Restorative Dentistry demonstrates positive and consistent results of true regeneration of the lost tissue due to periodontal disease. This study has been repeated in a multicenter randomized clinical trial confirming the FDA approval for periodontal regeneration. Periodontal treatment is covered by most dental insurance carriers. “The insurance codes used for LANAP are the same as the codes for traditional surgery. Since no preoperative treatment is needed, LANAP is more effective and less costly to patients”. This is truly a win-win. If you suffer from tender, red, swollen, or bleeding gums, call us today for an appointment to evaluate your condition. No Cut, No Stitch, No Fear! “Everyone in Dr. Klassman’s office made me feel as if I were their only patient. Dr. Klassman explained every detail of my procedure, and he and his staff made me feel very comfortable. If you are considering treatment, consider Dr. Klassman.” – Janene, K. Newark, Delaware. “Thanks for saving my smile Dr. Klassman! I knew something was wrong with my gums and teeth, but kept putting off getting the work completed, what an error on my part. Gums feel great, and teeth look much better, and none of the horrible pain that I expected.” – Al R., Milton, DE. Educated at Temple University School of Dentistry and Post Doctoral training in Periodontics at the University of Pennsylvania, Dr. Brad is the youngest Board Certified Periodontist in the State of Delaware. 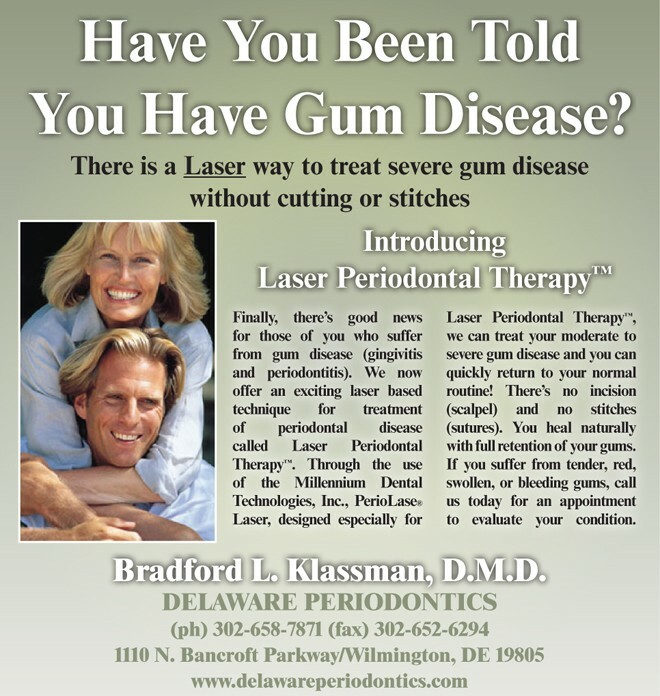 He is also the first Periodontist in the State of Delaware to use Laser Periodontal Therapy and the LANAP protocol. Dr. Brad is proud to provide patients with Virtually Instant Dental Implants with a Same Day Smile. He teaches at the Christiana Care Department of Dentistry and Oral Surgery, is a Diplomate of the American Board of Periodontology and is a member of the American Dental Association, Delaware State Dental Society, American Academy of Periodontology, and the Institute for Advanced Laser Dentistry. He lives in Hockessin, Delaware with his two children. He enjoys fishing and cooking his fresh catch of the day. Next Story → Sleep Apnea – No Laughing Matter!